The thermal-break system installed at Alupco’s factory ... advanced. The fully-automated thermal-break assembly machine from Muller Technologies of Switzerland is an advanced system with all settings and parameters controlled through a central computer, which displays all the different sections as well as other important information for production. The stored data can be recalled at any time, said a spokesman for Alupco, adding that the software can be pre-set to achieve precise results each time and every time. The machine can also be manually operated, he added. With Saudi Arabia considering laws to make thermal insulation mandatory in all buildings, Alupco believes this line will go a long way in meeting the market’s requirements for systems that ensure energy efficiency. “The company has been working with local and international designers to reduce energy consumption through the latest technologies. 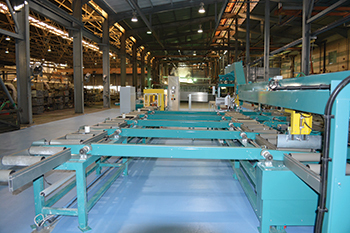 By investing in this brand new machine, Alupco has ensured that it will be able to meet market demand and provide customers with the highest quality of thermal breaks,” said the spokesman. The thermal breaks separate the aluminium frame into two separate interior and exterior pieces joined with the thermally low conductive polyamide. Adding polyamide strips to the framing members to separate the inside and outside aluminium profiles greatly enhances the thermal performance and reduces the amount of heat transfer, thereby saving energy while increasing occupant comfort. 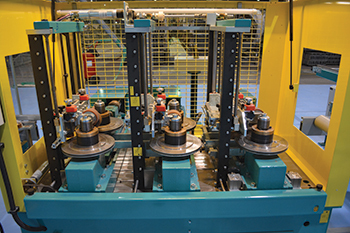 A highlight of the automated thermal-break machine is that it allows highly precise adjustments to be made during production. Using a thermal-break on windows and doors is a huge advantage as it reduces temperature transfer between the exterior and the interior. Explaining the way it works, he said: “The thermal break is made of substantially rigid, low thermal conductive polyamide which is mechanically locked in the aluminium window framing and can be more than a thousand times less conductive than aluminium and a hundred times less than steel. In addition, it also reduces sound transmittance by dampening vibration. “The insulating value of sealed insulating glass units can be improved by increasing the number of glass panes and air spaces or by filling these spaces with gas. Sealed glazing units with half-inch air spaces between panes provide optimal thermal performance. Citing a ‘real world’ example, Alupco said the 6,000-plus windows of the Empire State Building in the US were retrofitted with extruded aluminium window framing with thermal barriers. It was found that the building saved $777,770 a year by using thermal-breaks, which if extrapolated over a 30-year period, amounts to a whopping $23 million, he said.